Every October, we make the 3,745 mile trek from Juneau, Alaska to High Point, North Carolina for the Fall High Point Market. There are always new vendors we want to meet and current vendors we need to catch up with. And then, devoting time to amazing events with our designer friends from around the country maximizes the pleasure. This year, we took the red-eye so we could attend Friday’s Market Eve celebration at the Theodore Alexander showroom with our new friends at Steelyard. Wow! This beautiful freshly-renovated showroom was buzzing with people and flowing with champagne. Midway through our second glass, cruising through the Michael Berman rooms, we spotted our first trend, Yellow, and totally crushed on the Plaza Sofa. Though its subtle curvilinear form and antiqued brass base surely fed our aesthetic, it was its cover of golden velvet fabric that left us speechless. As much as green has dominated the design universe in the past few years, we predict that a shade of yellow could easily be a color of the year in 2019 or 2020 – a belief further validated by the various golden shades we kept seeing throughout the week. 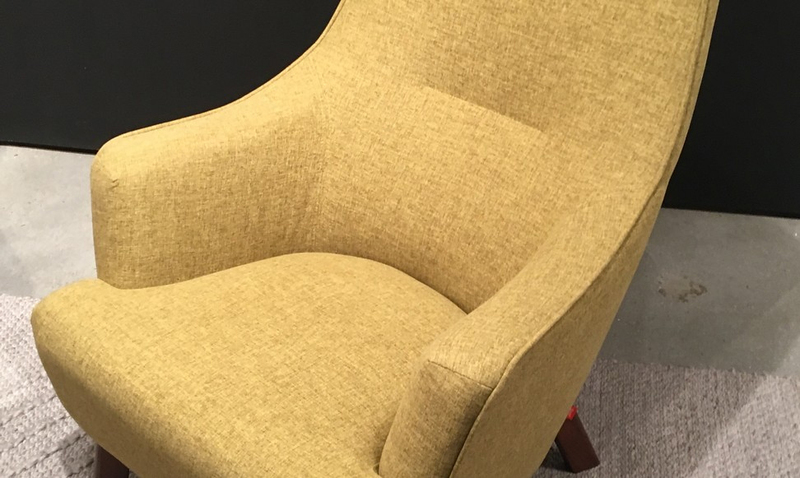 Check out the Hilary Chair by Gus Modern clad in Bayview Dandelion; its fluid curves and tailored lines speak to a contemporary mid-century vibe that we adore at Bauer/Clifton Interiors. And we discovered these beautiful yellow pillows during our visit to Universal. We’re calling it now – yellow is an emerging trend! Our Saturday morning started at Zuo where Jason was on a panel discussing Marketing Your Design Firm with other IDS members Shayla Copas and Jeffrey Johnson. Moderated by Nick May of The Chaise Lounge Podcast, the discussion was taped and will broadcast soon. From Zuo we scurried to Currey & Company, one of our favorite sources, and that’s where we spotted our next trend: Flower Power. At 36” in diameter, the polished brass Ottoline Chandelier features eight blossoming flowers that encompass the lights, and most certainly makes a statement. Additionally, the Monarch bench with its mirror base and floral fabric was beyond refreshing! Big florals seemed to be everywhere at Market, from chandeliers to fabrics, artwork to rugs. Jaipur Living is where we spotted this beautiful rug: Gramercy by Kate Spade New York. Beyond the tufted wool and silk texture, we loved how the floral bouquet, nonchalantly tossed to one side of the rug, added visual interest. As we continued trendspotting, we noticed that Transformative Wood is becoming more and more prevalent. However wood is manipulated – shaped, steam bent, and married with other materials – modern manufacturing and crafting continue to stretch the possibilities of this natural material to give it a fluid and sleek personality that is unexpected. The juxtaposition of coastal driftwood and glamorous Lucite elevates Currey & Company’s Durban Table Lamp to crisp, edgier heights. Bent ply arms give Gus Modern’s Lodge Chair a contemporary sculptural profile and we’re thinking that a pair of these flanking a fireplace would be pretty cozy on a cold, Alaskan night. Also in glorious wood was Four Hands’ Brooklyn Coffee Table. At 53” wide, this is a true shape-centric statement piece with Blonde yucca woods blended and smoothed for a soft look, rich with intrinsic depth. With a majority of our client work completed or in very good shape, we made time for parties and networking. We celebrated Veranda’s 30th Anniversary at Oly on Sunday evening. And, then on Monday, we participated in creative tailgating at Chandra’s craft beer tasting. There Jason exercised his shuffleboard skills in the company of our Steelyard friends, Janna Chanoux and Lindsay Paoli from Design Manager, and savvy reporter Thomas Lester from Home Accents Today.